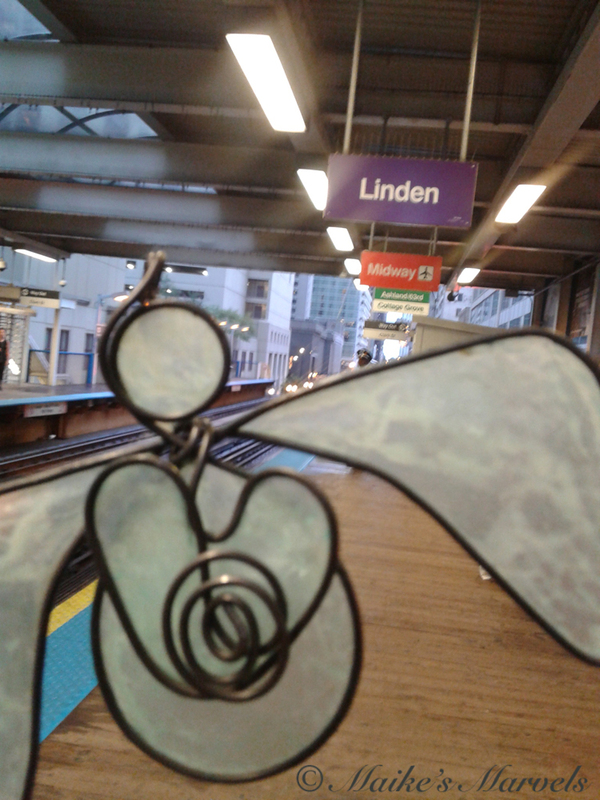 Last week I went downtown to visit a friend, and enjoyed riding the CTA Purple Line for a spell. 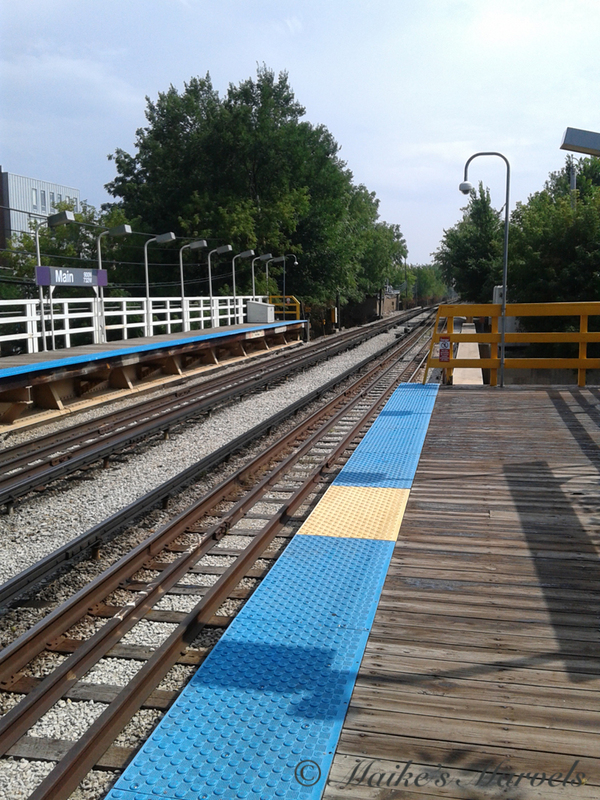 I love the express route as you get a glimpse of the beautiful skyline and cross so many intriguing neighborhoods. 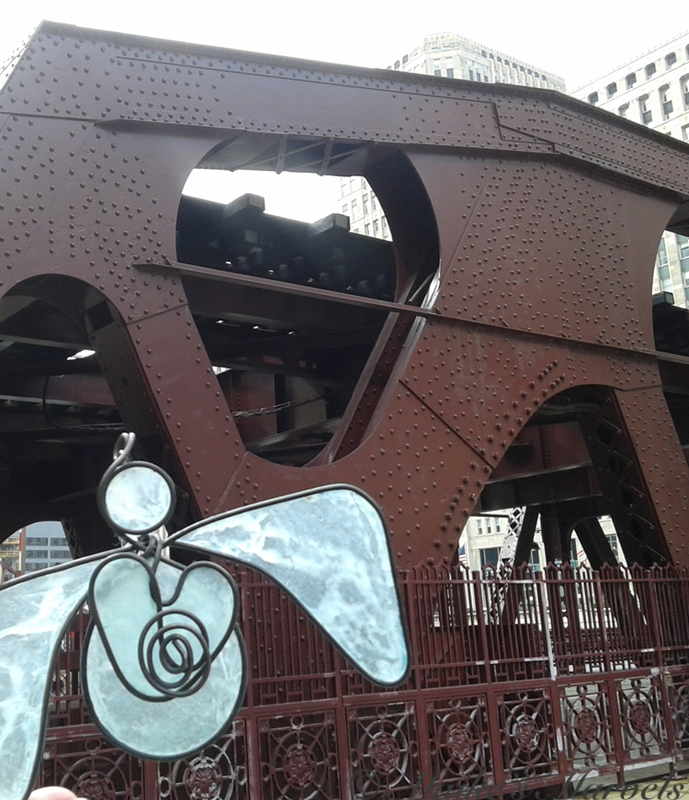 Since I got in a little early, I explored the Chicago Riverwalk before she got off work. 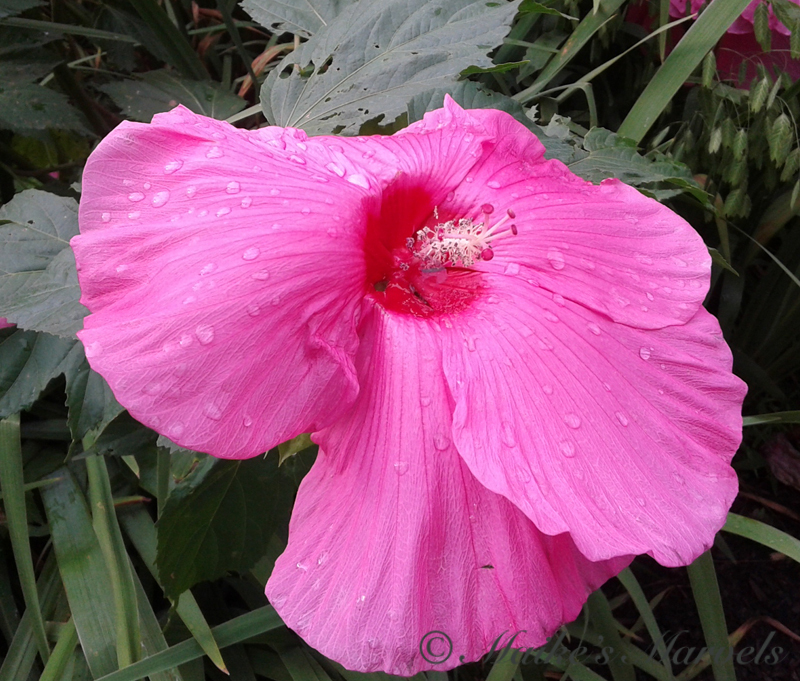 It was a wonderful day–a little humid but not oppressive. 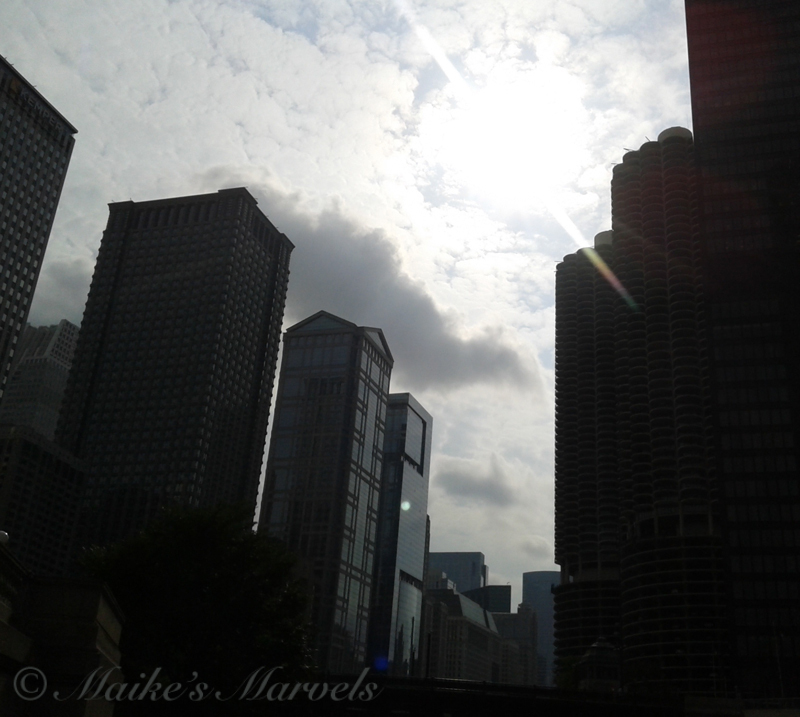 I enjoyed the sunshine and seeing how much the Riverwalk has livened up since I last strolled the opposite side. 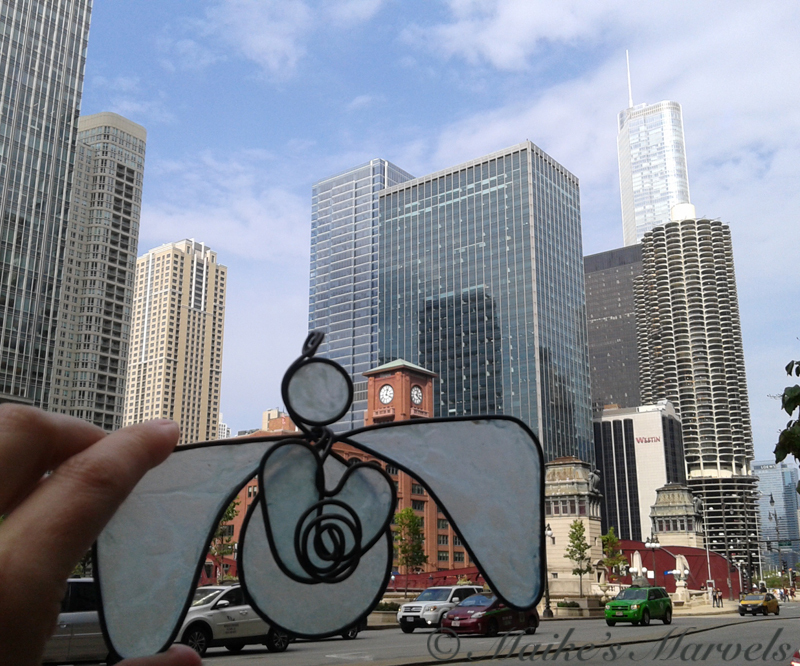 When I worked downtown only one side had a pathway that led to Navy Pier from the NBC/Tribune Tower Plaza. Now there is ample seating for anyone to enjoy the river, and lots of bars and restaurants are taking advantage of the captive audience. 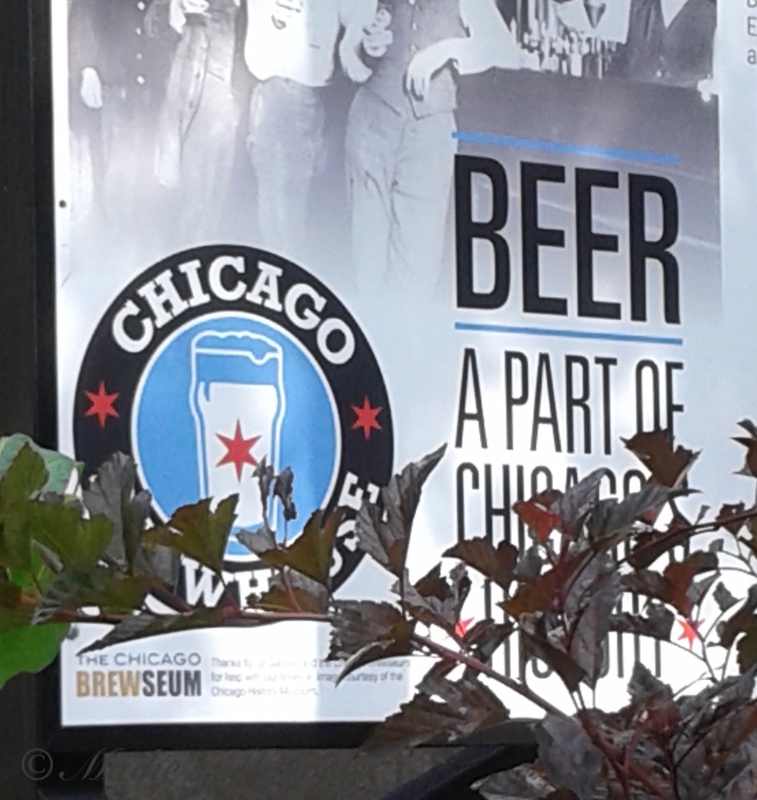 I want to visit this bar and the Brewseum in the future. 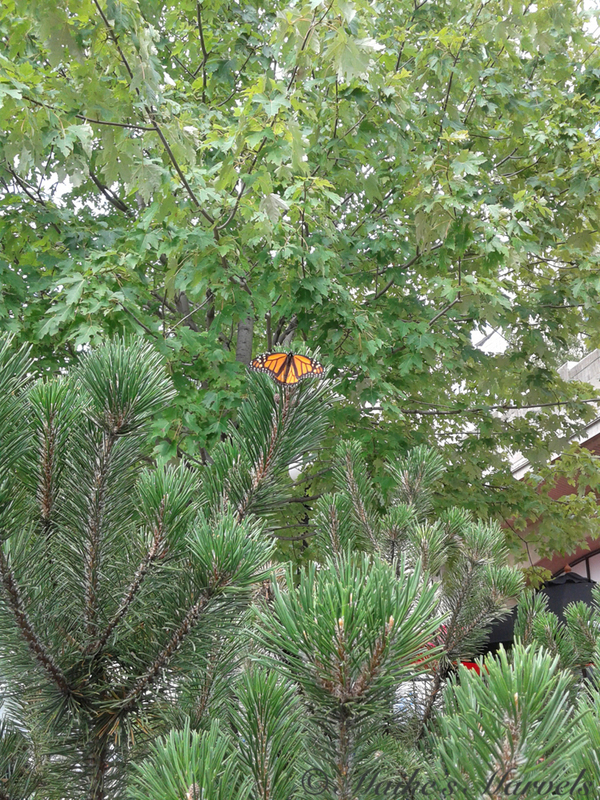 I only noticed the timeline because a Monarch had settled just in front of the brewery/bar. 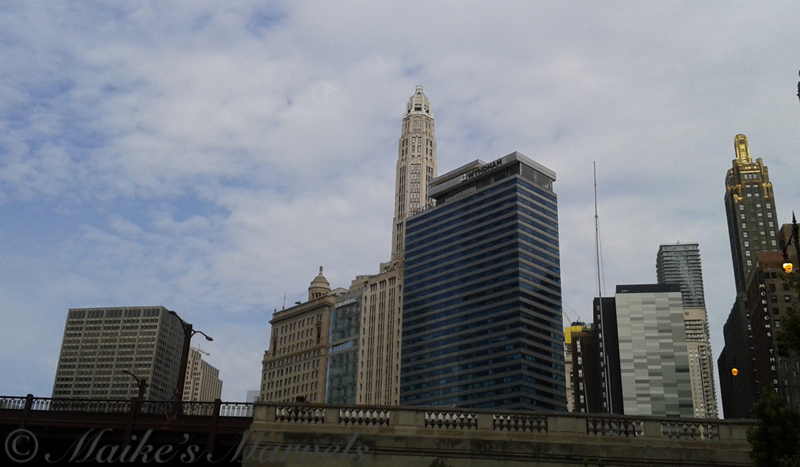 The Carbide and Carbon Building glistened beautifully in the sunshine. During the late afternoon on an August day the walk was teeming with a variety of people. Tourists were on the path taking photos, and people in tourboats were taking photos of us and the buildings above us. Along the way there are signs indicating the purpose of the “nature stations” (my term) providing shade and other river-related benefits. There were families strolling, people who just got off work enjoying happy hour, numerous runners and walkers getting their exercise in, people taking their dogs out, and security people monitoring the activity. 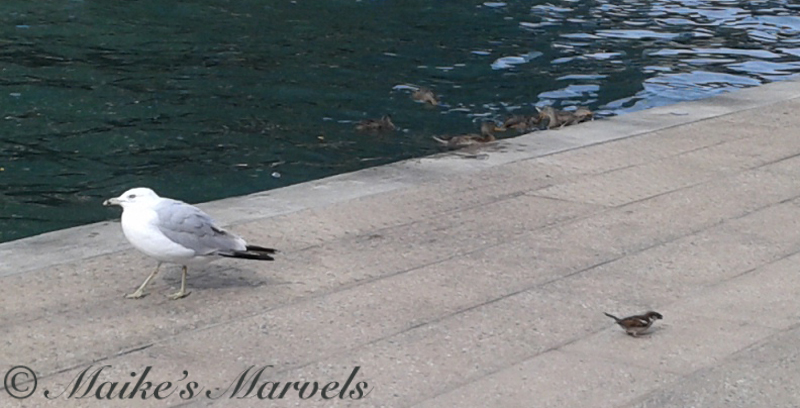 I tried to take pictures of the seagulls catching wind of ducks being fed, but my phone camera is even less responsive to birds in flight than my Panasonic that was at home. On the hibiscus another monarch was nectaring. 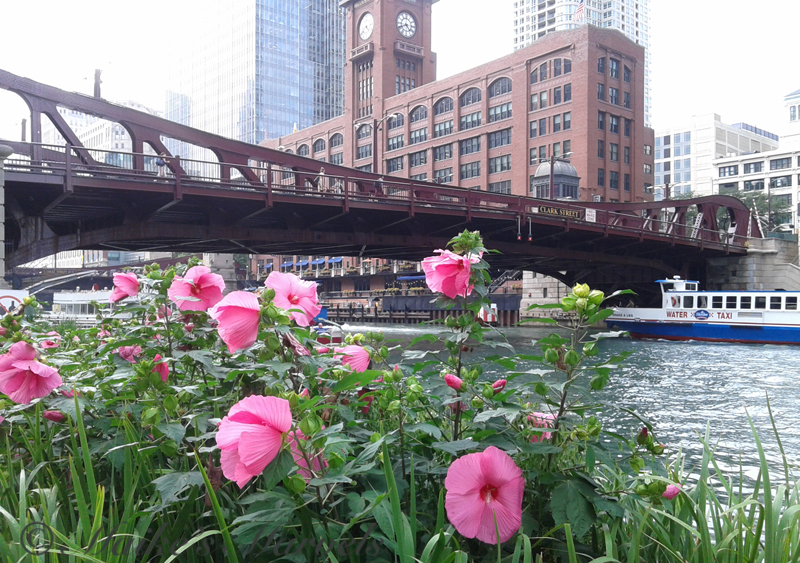 When I worked at NBC tower I fell in love with this corner of Chicago. I think officially it’s called Near North Side. 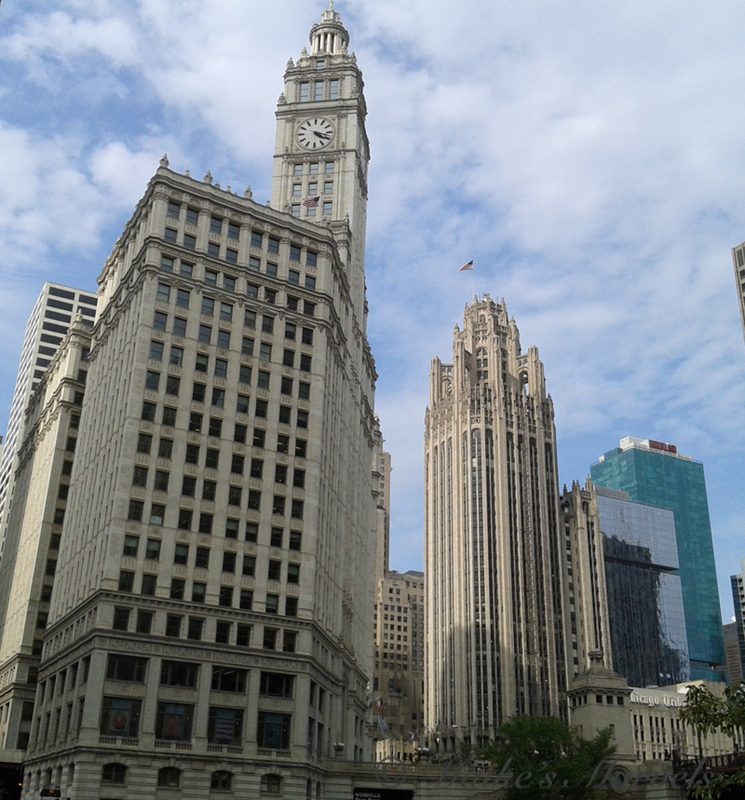 The Tribune Tower is going to be redeveloped, but I just read that the iconic Masthead will remain, after renovations. 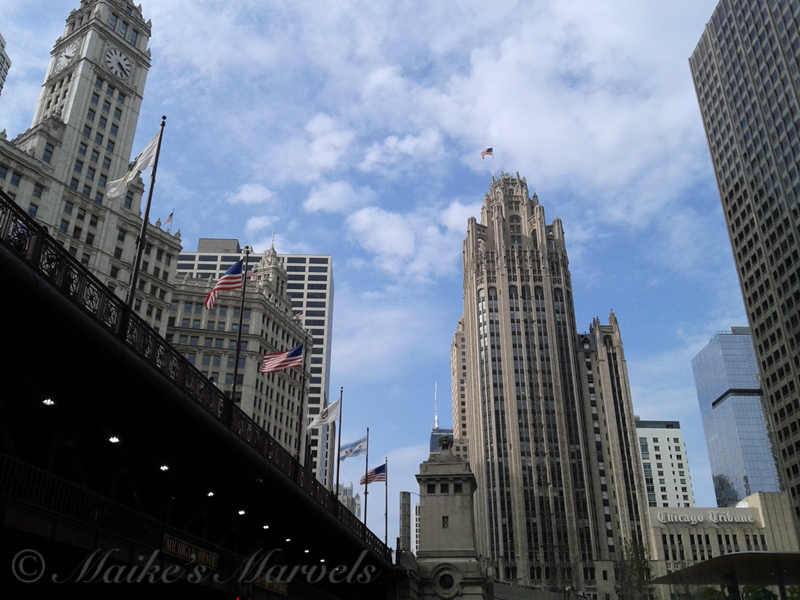 I love the variety of architecture here, and the honoring of the past while staying innovative as well. 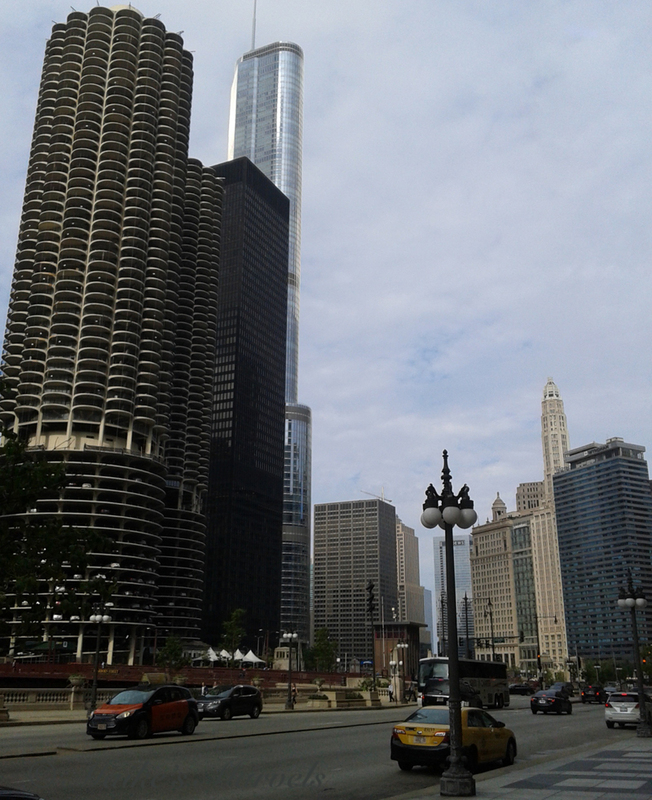 The Marina City looks like giant beehives to me. Certain angles do make it feel like Gotham City. 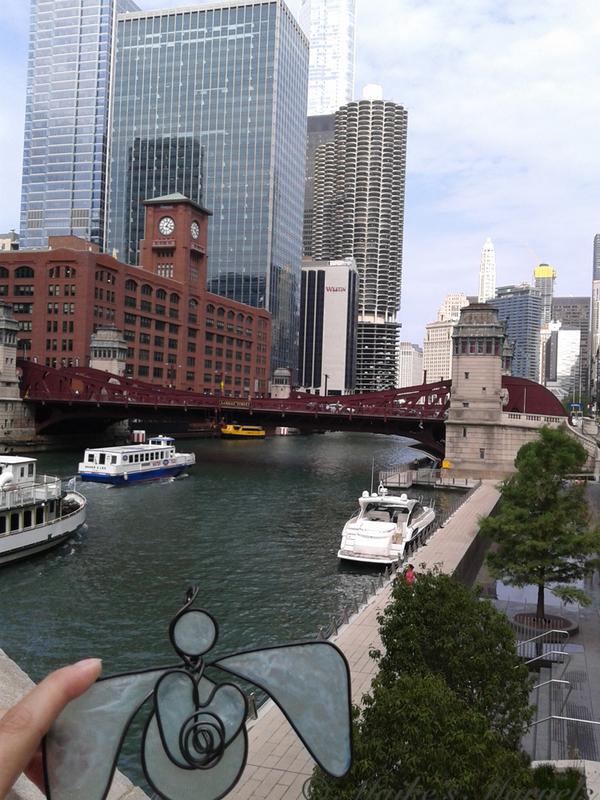 So stroll on down the riverwalk. 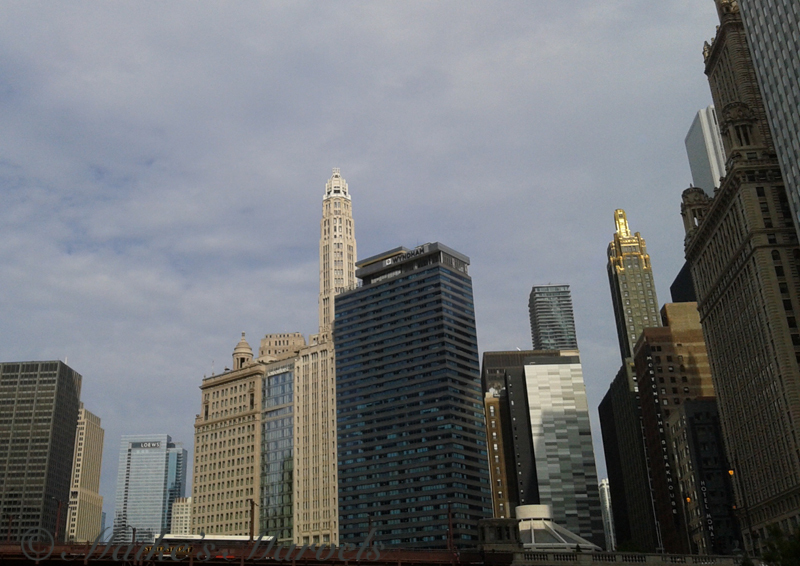 You’ll catch whiffs of trivia as the architecture tour cruises pass by. 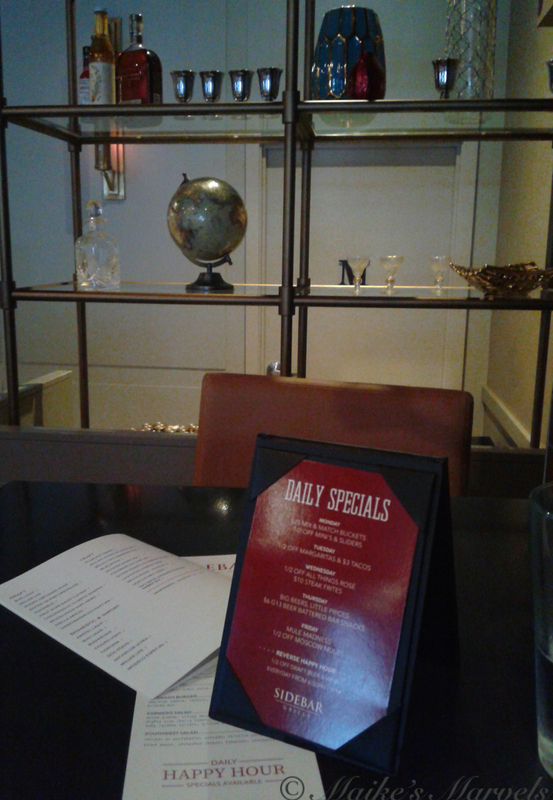 We had a lovely indoor happy hour at our regular spot, but vowed to go meet at a Riverwalk eatery next time. 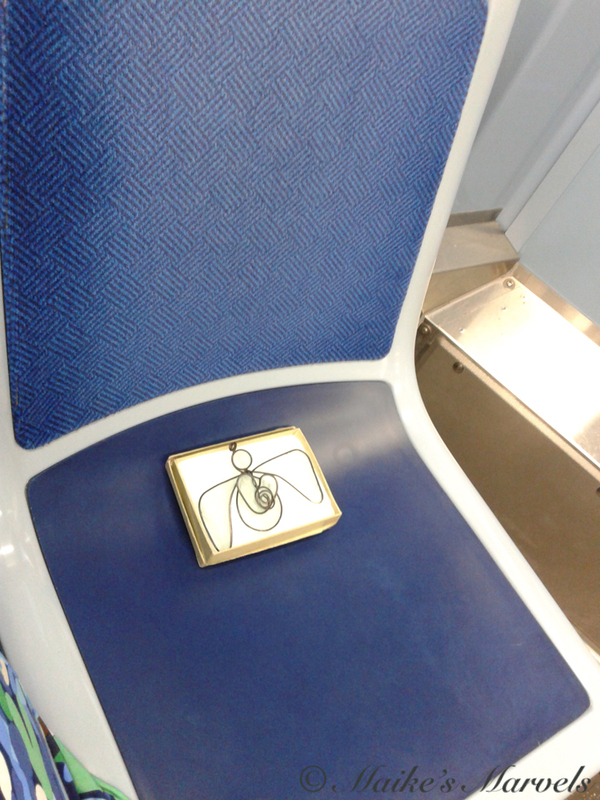 It was a fun Angel Purple Line adventure. 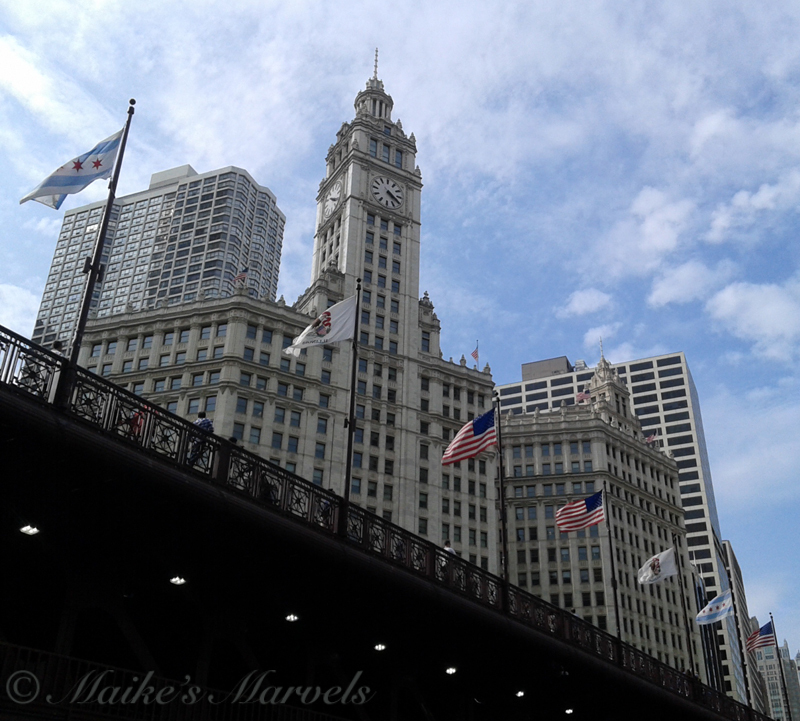 This entry was posted in Travel and Excursions and tagged Chicago Attractions. 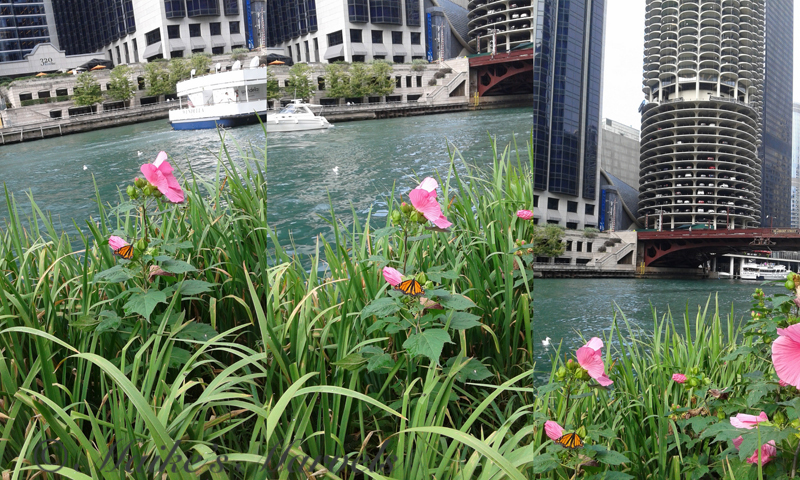 Chicago IL, Chicago Riverwalk, downtown, monarch butterfly, Monarch sighting, Near North Side, tourist in hometown, Wrigley Building.